5 Bedroom Detached House For Sale in Tunbridge Wells for Guide Price £725,000. The accommodation is comprised of a large sitting room with separate dining area, conservatory that leads out to the rear garden, kitchen with separate utility room, a study and further reception room that could be used as a fifth bedroom or separate family room and w.c. Stairs rise to the first floor landing where four bedrooms, one with a master en-suite bathroom and three of which are doubles can be found. A family shower room is also offered here. The property enjoys a delightful secluded position at the end of a cul-de-sac of just three houses, occupying a large corner plot with large private south facing rear garden, ample off road parking and a detached double garage. 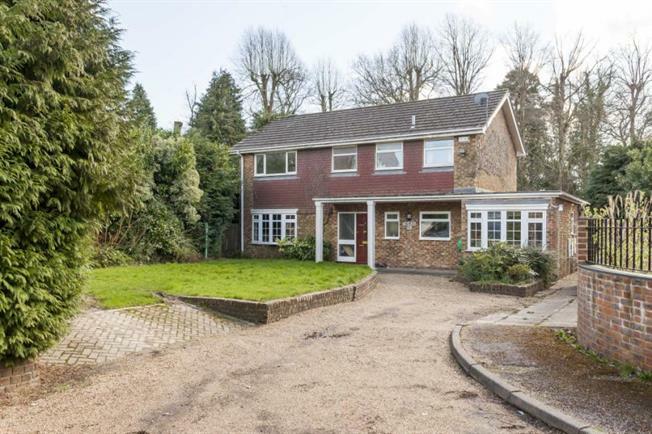 Location The property is in a quiet wooded cul-de-sac on the outskirts of Tunbridge Wells, with easy access to the mainline station that has services to London Charing Cross (via London Bridge and Waterloo East) and Cannon Street in under 1 hour. The property also offers access to the A21. Tunbridge Wells town centre offers a wide range of shopping facilities in the historic Pantiles, High Street and the Royal Victoria Place shopping centre. An out of town retail park about 2 miles away, has a Virgin Health Club, Bowlplex and Odeon Cinema.